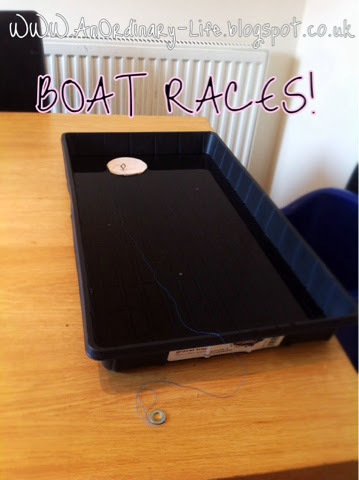 In this post we will be learning a bit about Hydrodynamics by having a boat race! Hydrodynamics refers to the study of liquids in motion, or with boats water in motion. We are looking at the hydrodynamics of boats and what shape helps a boat move more quickly through the water. To make this a fair test we did need to do a bit of maths first and the use of tools that are dangerous in younger hands - so I will put this in my harder experiments page but if younger children have help from a responsible adult this is possible for younger children to have fun with too. 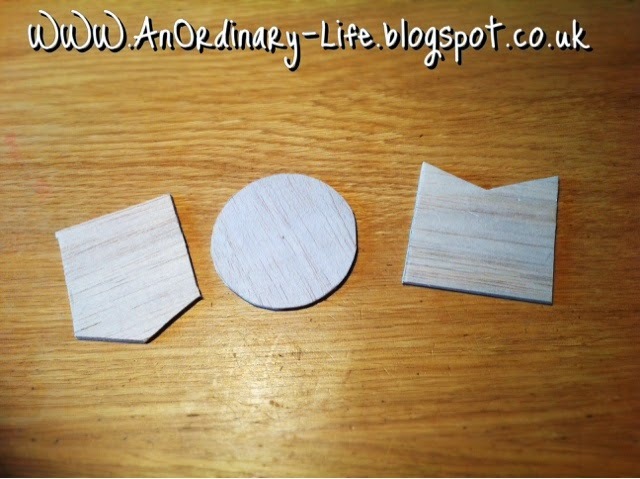 First you will need three different shapes of balsa wood that is at least 5mm thick. To make this a fair test it is important that the same amount of wood is used for each of these to make it a fair test; each 'boat shape' needs to have the same surface area and the same thickness. To do this as accurately as possible I worked out the surface area of each of the boat shapes so they were equal. As I have already said, this does involve some maths (that covers Key Stage 3 and above for a rough guide). I would suggest if you have younger children to just try your best to make the shapes similar or do the maths yourself. Once you have your measurements for your boat shapes transfer them to the balsa wood using tracing paper as your guide. All we did was trace the shapes, we had made as accurately as possible on the paper I used to do the maths side of this project and then put the tracing paper the other way on the balsa wood and drew over the back of the tracing paper which then transferred the drawing of the shapes on to the wood ready as a template for STEP THREE! Carefully cut out your shapes - you will need to use a very sharp crafting knife for this part so adult supervision is necessary and it is my advice that younger children have an adult do this part for them. It is important that you have a self healing matt underneath and you take your time. Put your gravel tray on a table and fill it half way with water. Screw an eyelet screw at the front of your boats. Cut three pieces of cotton thread so they are 1 metre long each and tie 1-2 washers to one end of each of the meter long pieces of thread. Tie the other end of one of the threads through an eyelet crew that's attached to one of your 'boats'. Do the same for the other two 'boats'. BEFORE you begin hypothesise - in this case ask the children to predict which boat they think will move fastest in the water. If you like you can write down your predictions in your Science Note Book. 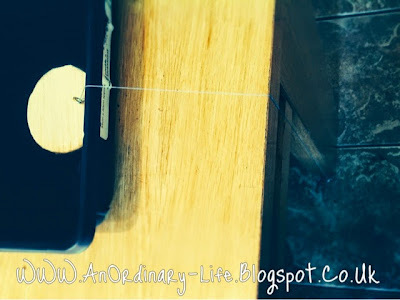 Then gently push all the washers off the table at the same time! Remember to be a science experiment we need to make this a fair test! DO NOT PULL THE WASHER OR THE THREAD TO TRY AND SPEED THE BOATS UP AS THIS WILL LEAD TO AN UNFAIR TEST AS ONE BOAT WILL HAVE LESS FORCE PUT IT THAN ANOTHER THAT WAY! IMPORTANT: USE THE SAME AMOUNT OF WASHERS ON EACH OF THE BOATS - again this helps to keep this a fair test. If you have done the test correctly the washer should hang from the thread off the table like in the photo above. Which boat won? Did you guess correctly? 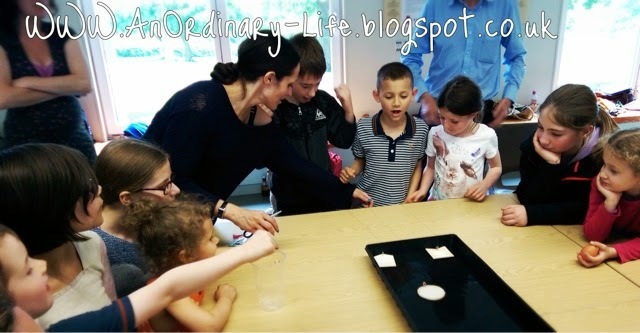 In science it's not about guessing it right, it's about discovery and learning by experimenting! I do plan to have a maths post to go with this for those who would like it but I thought I'd post the science project first. 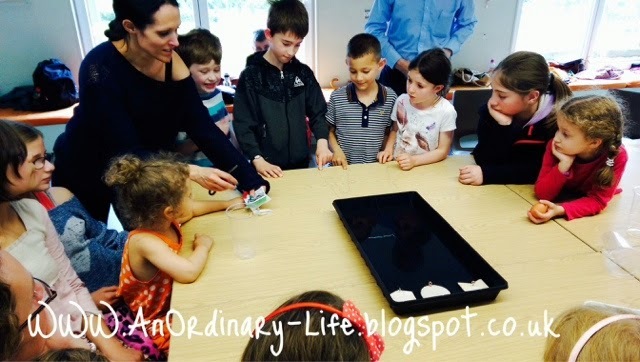 This was a huge hit at science group yesterday!